Here's a bit of design work from months ago. I just got samples in the mail. My client L.L. 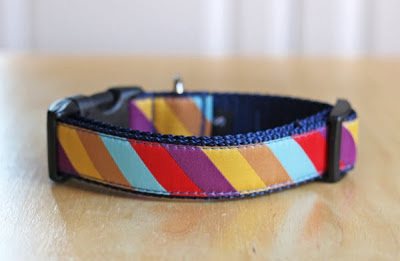 Lily was approached by JC Penney to produce some exclusive dog collar sets, and I was contracted to create designs for the woven ribbon that goes on them. "Something Ellen deGeneres would like" was the instruction. (Apparently Ellen would have a hand in picking the designs, being the official JCP spokesperson.) Um... I have no idea what Ellen's taste in dog collars is. 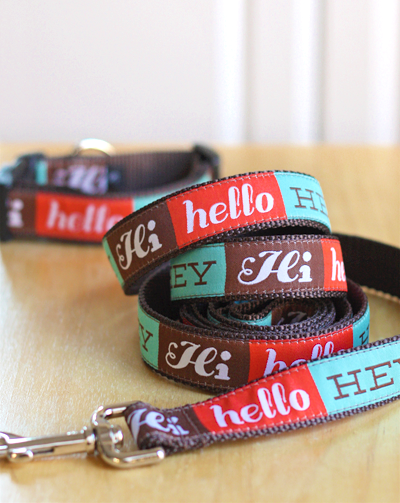 And I have no idea if she ever saw them, but these two options were selected: retro-style greetings and a basic stripe. The "Hey" design is my fave. It's what I hope dogs are thinking when I pass them on the sidewalk. Instead of, "I would bite you if only my leash was long enough." 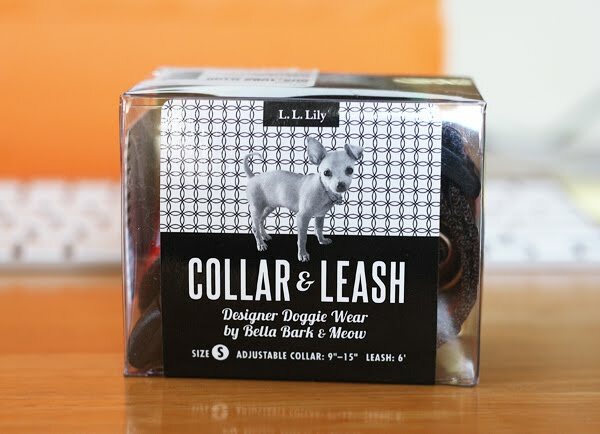 The collar and leash sets come with 6' leashes and adjustable collars in sizes S (9"-15"), M (12"-18"), and L (14"-21"). Rumor had it they would be in 600 JCP stores as of Nov. 1. I see they're available online, too. Aww... makes me wish I had a dog! Almost. I like the "Hey" one too. It's definitely what my dog Petey is thinking when we pass people on the trail. Nice work! Congrats--that's so cool! And I LOVE your designs! SOOOO rad, I love them!! If I had a dog I'd get em. Wow! Congrats- both styles look awesome! So, so cool Jessica Jones! Your work is beautiful. I work at JC Penney and love how cute these are! I got excited when I saw a post about them in my reader! How cool that you had a hand in these! Great job! 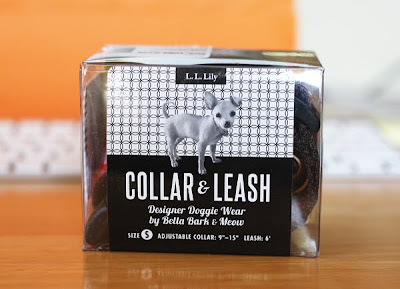 I love them both and I have 5 dogs so I'm always in need of leashes in collars!! Neat stuff. If I ever had a dog (which is very unlikely) I would buy them both. They are absolutely adorable! Cool!! Love them. I'll keep an eye out for them on the JCP site. They turned out so cute! It's unbelievable how boring the choices are out there. :) Congrats! Aw I'd love the Hey! one for Hamlet! Will have to check if they ship to Germany. I'm going to start saying "amazies" and see if catches on. As in, "I love that tote bag you just sewed. It's amazies!" Oh, I misread the word. That's an "l". Amazles. As in, "Watch me do this magic trick. It will delight and amazle you." I like the "I would bite you if only my leash was long enough "
line better....at least that's what I think my dog is thinking.